A few items remain to commemorate Camp Colt. 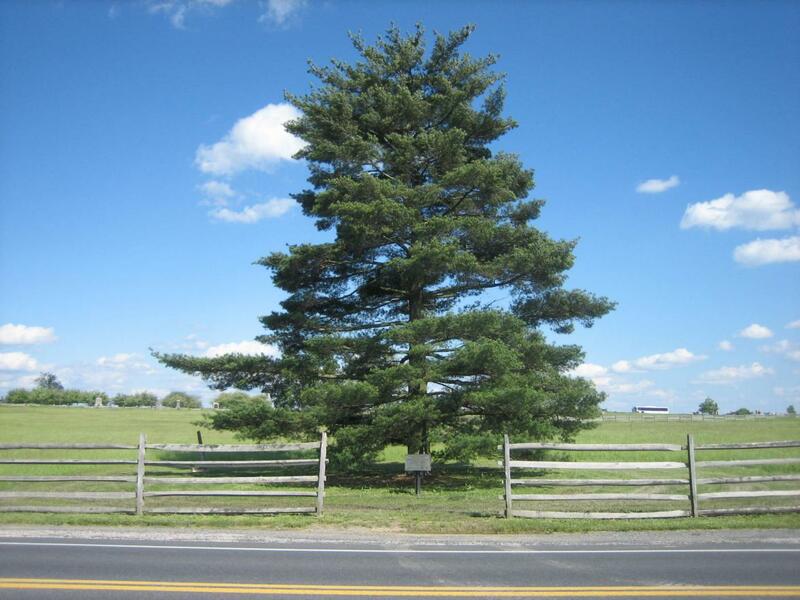 This tree and the marker below it were placed here, along the Emmitsburg Road in August, 1954 in honor of President Eisenhower. “Ike” had been inaugurated the 34th President of the United States the previous year. This view was taken from the west facing east at approximately 4:30 PM on Thursday, May 22, 2008. Camp Colt was established in 1917, and opened at Gettysburg National Military Park in March, 1918 as the first post to train soldiers to use tanks during World War I. 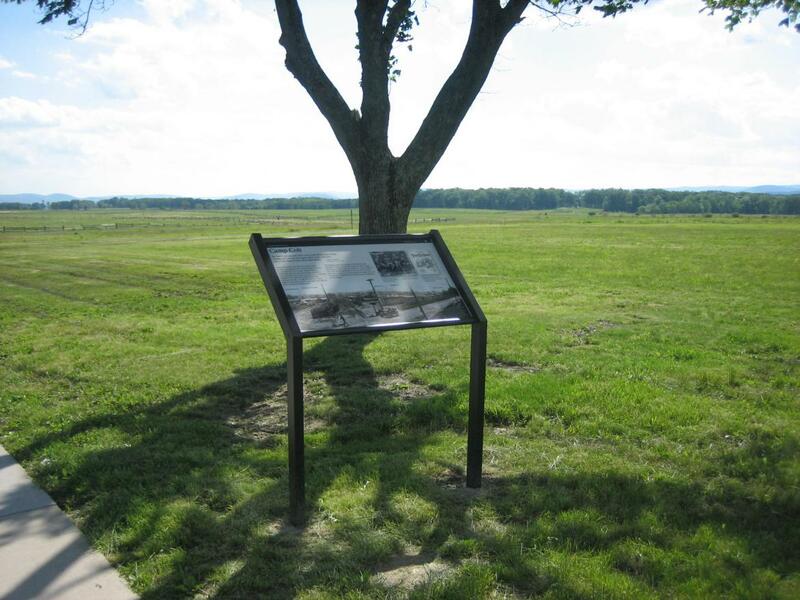 The main section of the camp was in the fields made famous 55 years before, by Pickett’s Charge. 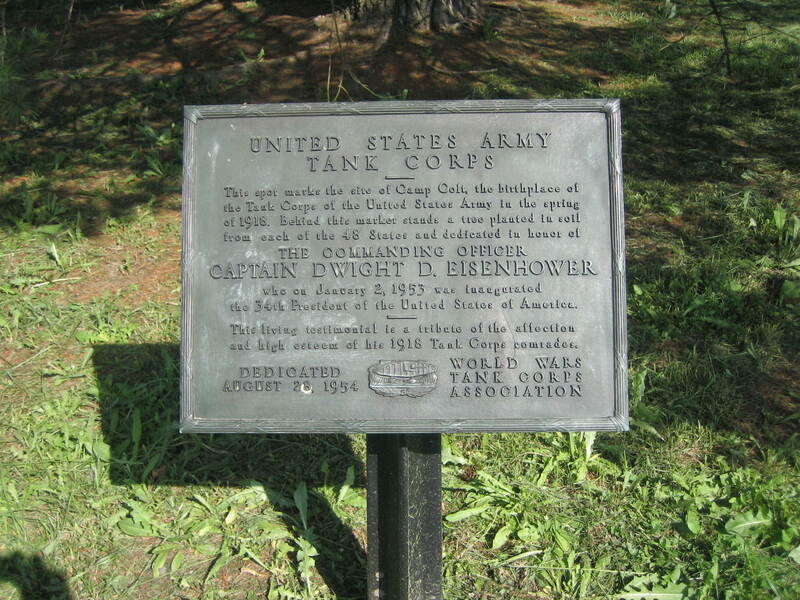 The commander of Camp Colt was Captain Dwight D. Eisenhower. Eisenhower would earn the rank of Major, and the Distinguished Service Medal for his efforts at Camp Colt, and he and his wife, Mamie, fell in love with the area. After “they” retired from the military, the Eisenhowers made their home near Gettysburg, west of Seminary Ridge. The text of the plaque at the foot of the tree. This view was taken from the west facing east at approximately 4:30 PM on Thursday, May 22, 2008. The tree and marker are near the center of this photograph. To the right of the tree is the tree growing out of “the angle” in the stone wall. To the right of that tree is “The Copse of Trees,” or group of trees, or clump of trees. This view was taken from the northwest facing southeast at approximately 4:30 PM on Thursday, May 22, 2008. The tree and plaque are right of center in this photograph. The small white structure is the Brian or Bryan Barn. The trees to the left of the barn are in Ziegler’s Grove. This view was taken from the southwest facing northeast at approximately 4:30 PM on Thursday, May 22, 2008. 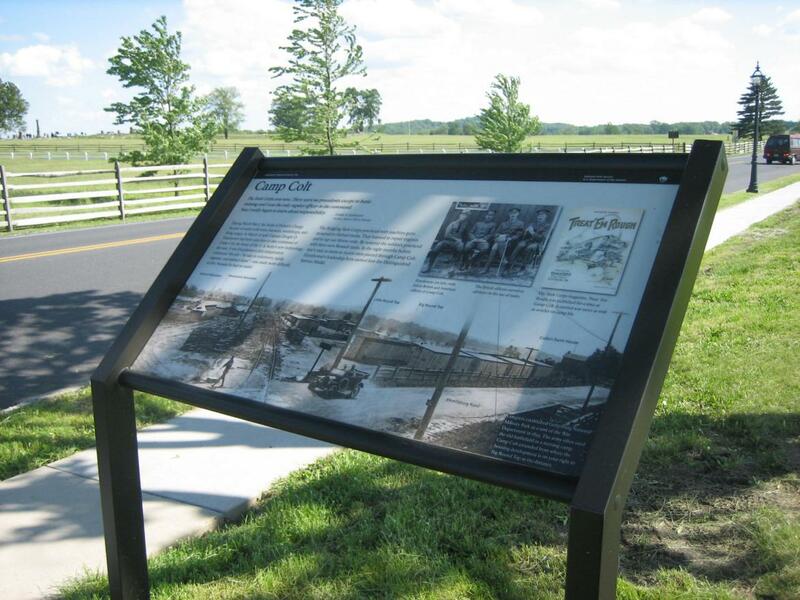 The National Park Service has now erected a wayside exhibit for Camp Colt on the west side of the Emmitsburg Road. This view is the same direction the photographer was facing when he took the main photograph on the wayside. The commemorative tree for Camp Colt is in the far right of this picture, behind the lamp post. This view was taken from the northwest facing southeast at approximately 4:30 PM on Thursday, May 22, 2008. 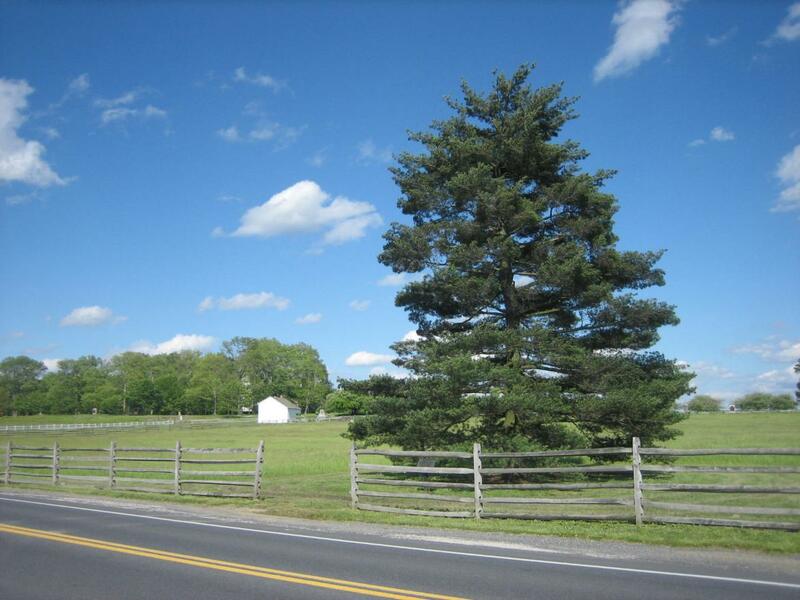 The commemorative tree is just to the left of the lamp post in this photograph facing down the Emmitsburg Road. 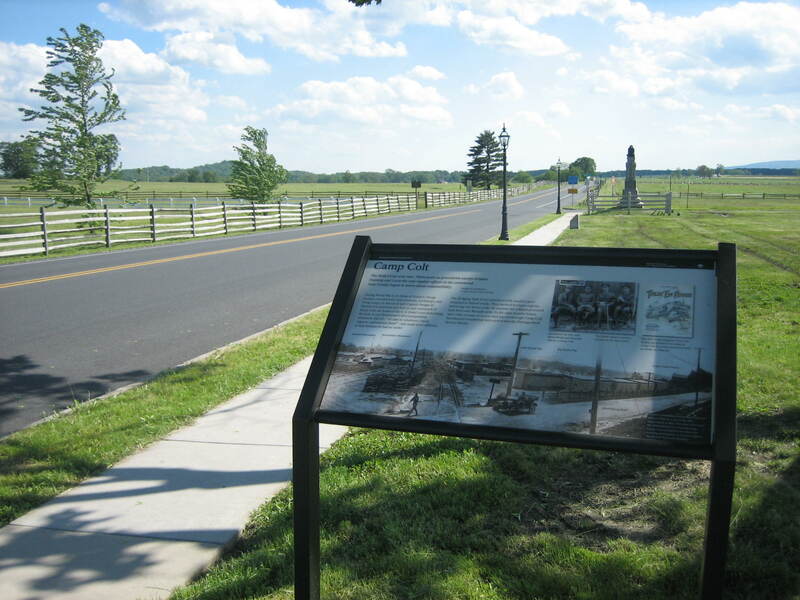 The monument to the 8th Ohio Infantry Regiment is above the wayside, surrounded by a fence. The small French Renault tanks for Eisenhower to train his men did not arrive until the summer of 1918. He had to practice with guns mounted on flat bed trucks until their arrival. 10,000 men passed through Camp Colt during World War I. Approximately 150 of them died here from a Spanish Influenza epidemic. This view was taken from the north facing south at approximately 4:30 PM on Thursday, May 22, 2008. The 192 acre Camp Colt stretched from the subdivision “Colt Park” just out of sight to the right of this photograph towards Big Round Top to the southeast. During World War II, these fields on the west side of the Emmitsburg Road were home to Camp Sharpe, a Prisoner of War Camp. Approximately 300 Germans were held here for approximately six months in 1944. The Virginia State Monument is on the ridgeline to the right of the plaque. 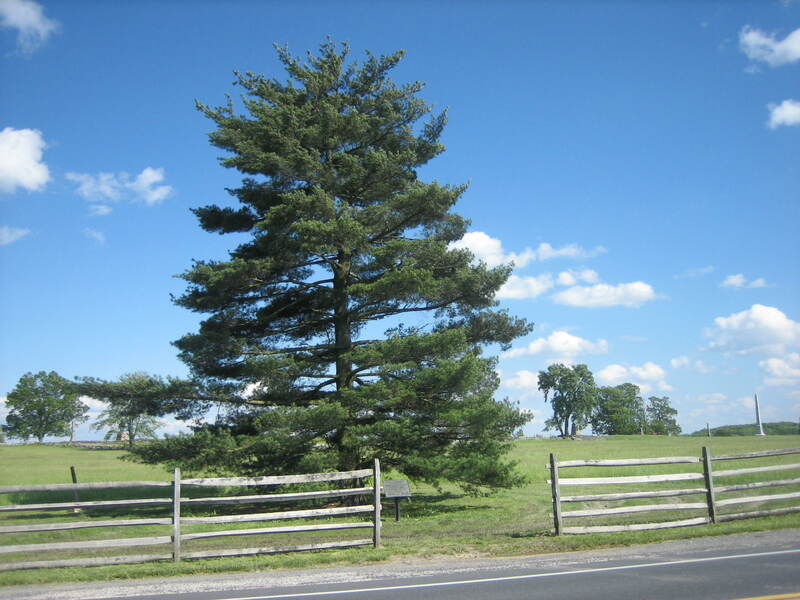 They were utilized in repairing roads, cutting and milling lumber, and picking crops in this area. This view was taken from the northeast facing southwest at approximately 4:30 PM on Thursday, May 22, 2008.